The ESQ by Movado Women's Bali Stainless Steel And Black Ceramic Bracelet Watch is a gorgeous vision of beauty, the kind of timepiece that shows a woman's true fashion genius. 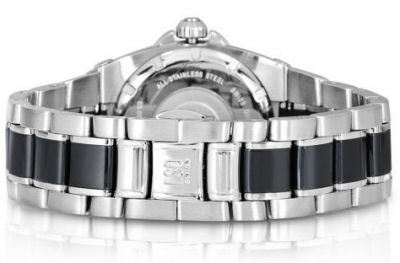 The silver-tone, stainless steel bracelet watch has a black ceramic accent down the middle of it. The etched, silver-tone, circular bezel is accented with diamonds. It beautifully complements the black dial, which features oversized Arabic numbers at three, nine and 12 o'clock and a calendar window at six o'clock. Diamond hour markers mark the other positions, and the dial also features arrow-shaped luminous hands and white sweeping seconds hand. 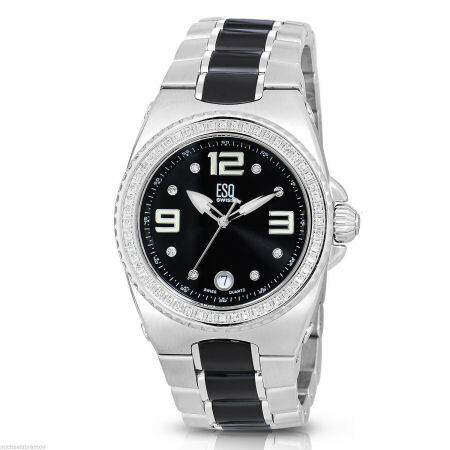 This watch features a scratch-resistant mineral crystal and is water resistant to 90 feet.